Daniel 7 's 1st Beast Lion with eagle's wings plucked and made to stand like a man...Israel's US support by 2parties taken away? 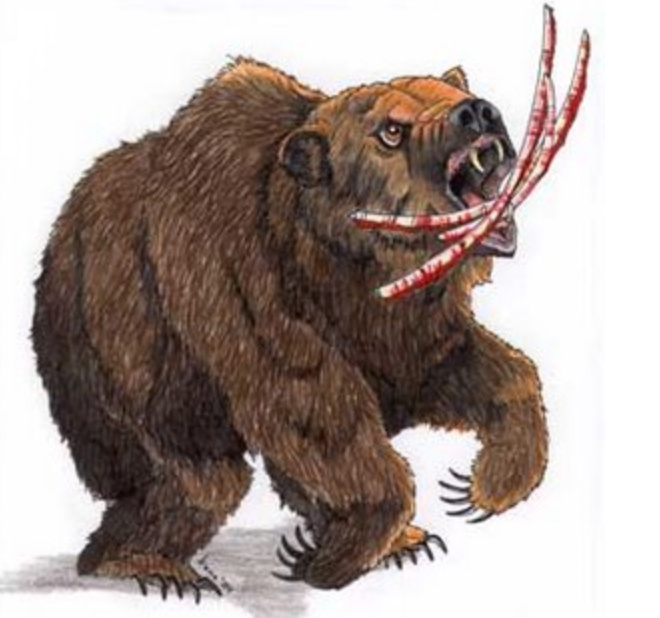 Daniel 7: 2nd Beast Bear [Russia] devours 3 ribs [Egypt, Libya, Syria]? 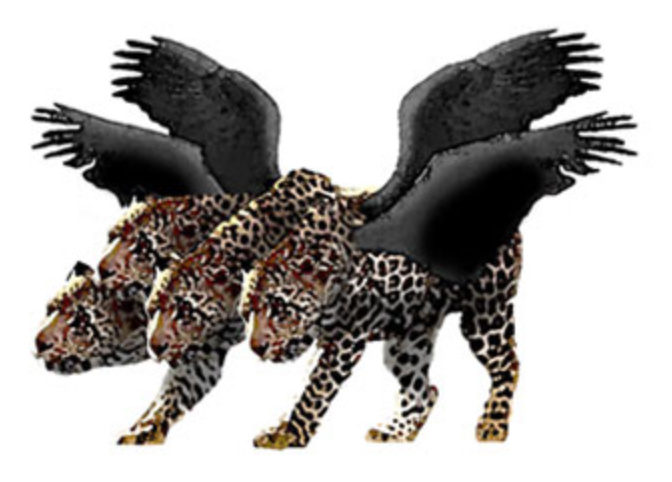 Daniel 7: 3rd Beast Leopard with 4 heads and 4 wings the Quartet? UN+EU+US+RUSSIA? 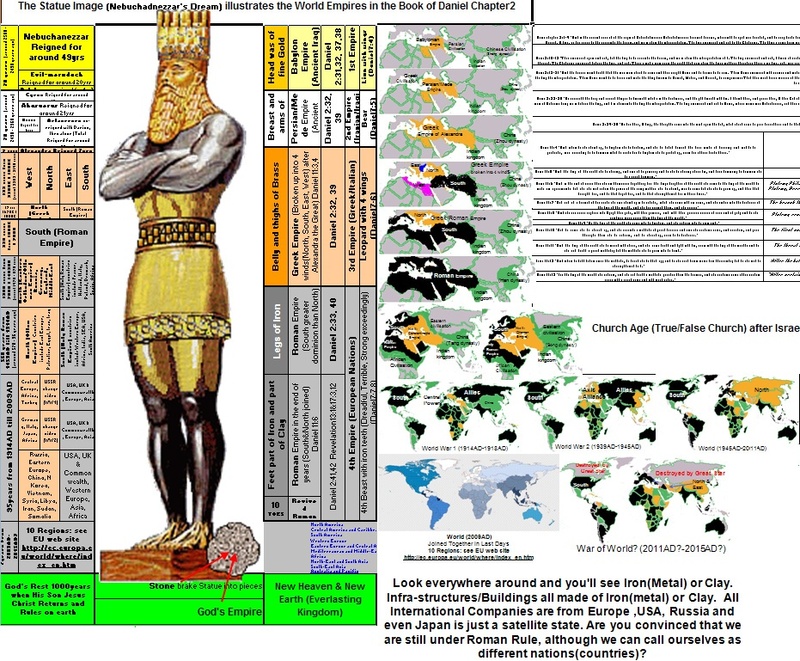 Babylonian Persian Greek Roman Revived-Roman Greek Persian Babylon Empire? 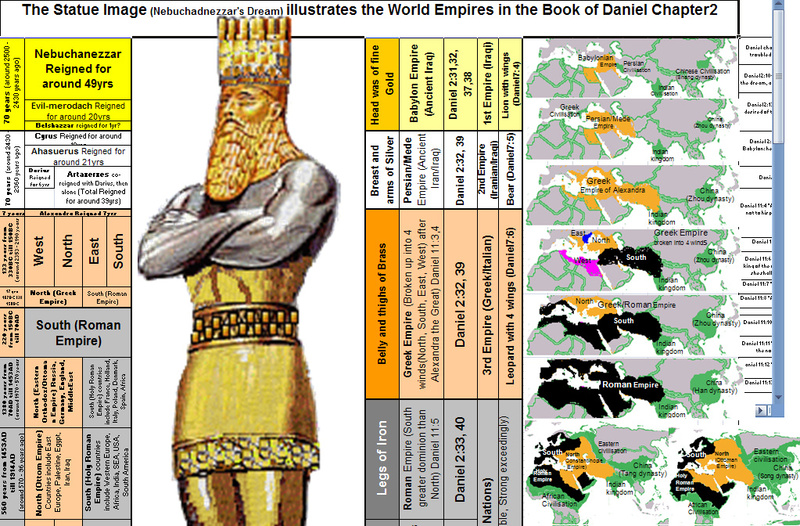 Could it be that Israel was destroyed by Gentile Empires and the 4 Beast is reversed back to Babylon? back to Babylon [1-NewWorldOrder] Empire? Daniel 2:38-40 "And wheresoever the children of men dwell, the beasts of the field and the fowls of the heaven hath he given into thine hand, and hath made thee ruler over them all. Thou art this head of gold. 40 And the fourth kingdom shall be strong as iron: forasmuch as iron breaketh in pieces and subdueth all things: and as iron that breaketh all these, shall it break in pieces and bruise." Could USA be divided and around 50% given to IRAN? Daniel 5:28 "PERES; Thy kingdom is divided, and givento the Medes and Persians." Could USA be destroyed like 1st Fallen Babylon? before the Last Babylonian Empire Falls? then Reverse Order back to 1st Kingdom? 4th Kingdom: European Union? as iron that breaketh all these, shall it break in pieces and bruise.? 3rd Kingdom: United Language of Europe? bear rule over all the earth? 2nd Kingdom: Muslim Brotherhood & Roman Catholics? to build the 3rd temple? 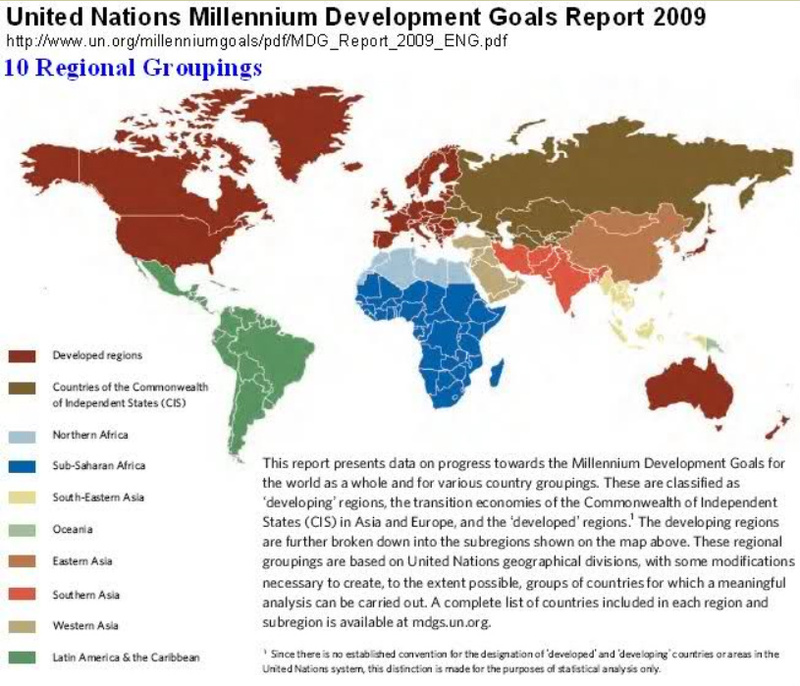 1st Kingdom: New World Order?Head of Gold? see Another Interpretation of Daniel 7? the 4 beasts are endtime Kings... not kingdoms!?
" 3 And four great beasts came up from the sea, diverse one from another. 5 And behold another beast, a second, like to a bear[RUSSIA? ], and it raised up itself on one side, and it had three ribs in the mouth of it between the teeth of it: and they said thus unto it, Arise, devour much flesh. 17 These great beasts, which are four, are four kings[not kingdoms? ], which shall arise out of the earth. see Another Interpretation of Revelation 17? the harlot is Great City [New York or Vatican or Iraq's babylon]? 7heads are 7hills or 7continents[Europe, North America, South America, Asia, MiddleEast, Australia, Africa]? 3 So he carried me away in the spirit into the wilderness: and I saw a woman[great city: New York or Vatican] sit upon a scarlet coloured beast[4th Kingdom or Satan], full of names of blasphemy, having seven heads[7 mountains] and ten horns[10 regional leaders]. 6 And I saw the woman[great city: New York or Vatican] drunken with the blood of the saints, and with the blood of the martyrs of Jesus: and when I saw her, I wondered with great admiration. 7 And the angel said unto me, Wherefore didst thou marvel? I will tell thee the mystery of the woman[great city: New York or Vatican] , and of the beast[4th Kingdom or Satan] that carrieth her, which hath the seven heads[7 mountains] and ten horns[10 regional leaders]. 8 The beast[4th Kingdom or Satan] that thou sawest was, and is not[yet come out of hell]; and shall ascend out of the bottomless pit, and go into perdition: and they that dwell on the earth shall wonder, whose names were not written in the book of life from the foundation of the world, when they behold the beast that was, and is not, and yet is. 10 And there are seven kings[NOT the7 heads-mountains] : five are fallen[Egypt, Libya, Syria, USA?, Russia?] , and one is[King of North?] , and the other is not yet come[King of Babylon? ]; and when he cometh, he must continue a short space. 11 And the beast [4th Kingdom or Satan] that was, and is not, even he is the eighth[King of Babylon? ], and is of the seven[King of USA? ]; , and goeth into perdition. 12 And the ten horns[10 regional leaders] which thou sawest are ten kings[10 regional leaders], which have received no kingdom as yet; but receive power as kings one hour with the beast. 16 And the ten horns which thou sawest upon the beast, these shall hate the whore, and shall make her desolate and naked, and shall eat her flesh, and burn her[great city: New York or Vatican] with fire. 18 And the woman which thou sawest is that great city[New York or Vatican or Iraq Badhaq? ], which reigneth over the kings of the earth." 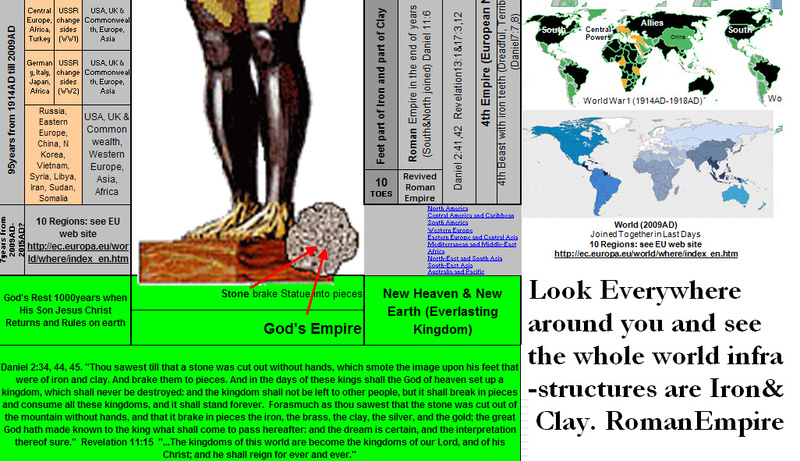 then we see Another Interpretation of Revelation 13? 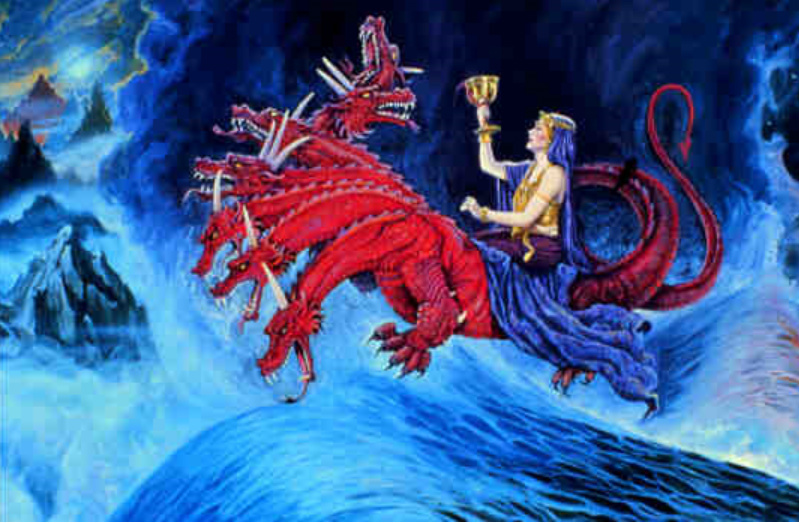 the 4th Kingdom is the beast[King of Babylon] rise out of the sea. 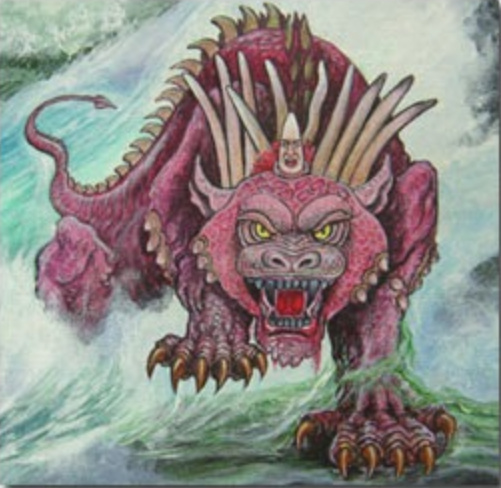 13 "And I stood upon the sand of the sea, and saw a beast rise up out of the sea, having seven heads and ten horns, and upon his horns ten crowns, and upon his heads the name of blasphemy. 7 And it was given unto him to make war with the saints, and to overcome them: and power was given him over all kindreds, and tongues, and nations." The 1st beast[king] of Daniel7 is Israel and the wings was given to the woman of Revelation 13 to flee into wilderness?!?! Israel then become weak and stand with man's heart? when 4th beast[AntiChrist] sits in the 3rd temple? and a man's heart was given to it[LION]." Could the woman be Judah being given 2wings of a great eagle to fly into the wilderness, her place, nourished 3.5times from face of devil? from the face of the serpent." and brought them unto Himself! taketh them, beareth them on her wings:"
Proverbs:23:5: "Wilt thou set thine eyes upon that which is not? they fly away as an eagle toward heaven." Then Israel became weak and stand [with Michael] when AntiChrist sits in the temple of God in Jerusalem? and at that time thy people[Israel] shall be delivered, every one that shall be found written in the book." [Israel's US' military support :wings implies Democratic&Republic Parties?] were PLUCKED or DESTROYED? by Nuclear War attacked on Christian states? 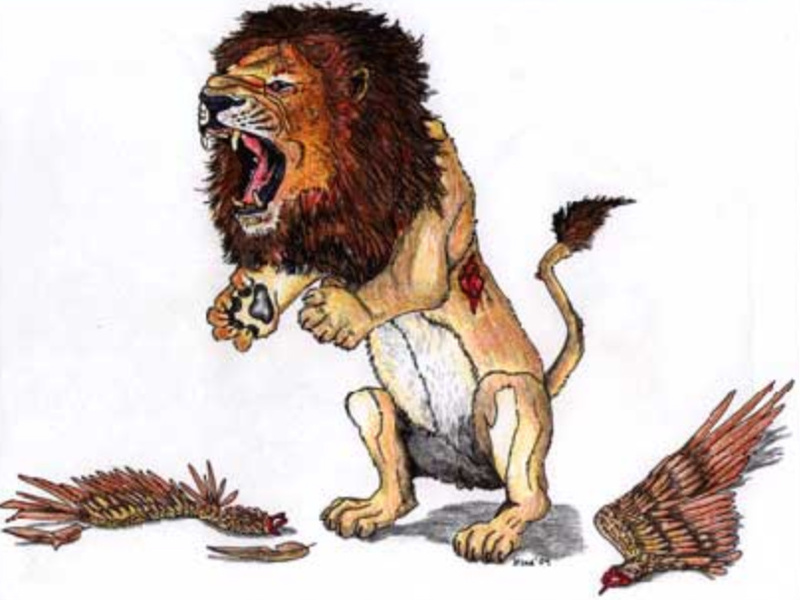 Daniel chapter 7 has few verses confirming 3 Kings literally killed[Plucked up by the roots]? and he shall subdue three kings[Egypt Mursi,Libya's new leader&Syria's new leader?]."